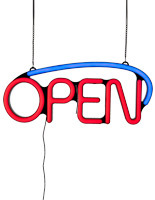 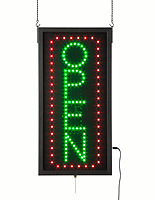 Looking for open closed signs or industry specific messaging? 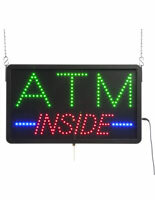 We offer a huge variety of write-on, LED-lit and neon-look plastic message boards designed to both inform and attract customers. 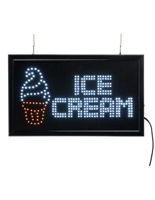 Our LED open closed signs can do everything from provide a day-by-day listing of business hours to advertising frozen yogurt. 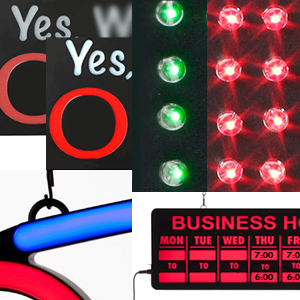 Different construction and mounting styles mean that it is easily possible to find the perfect size, style and price fixture that will match any business needs. 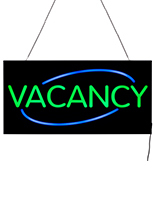 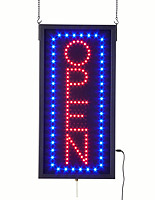 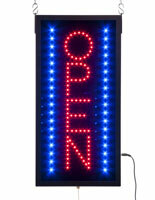 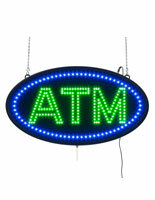 From hanging LED open/closed signs, also known as open closed signage, that change colors and wording during business hours to simple write-on message boards with suction cups for window or glass door attachment, customers are attracted to bright colors, simple graphics and plain text. 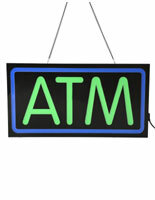 These economical plastic fixtures are ideal for any business, from restaurants to services and professional or commercial organizations. 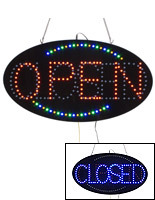 What other kinds of messages come on Open Closed Signage? 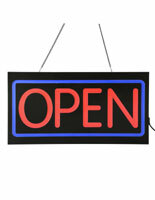 Open Closed Signs themselves are available in different styles. 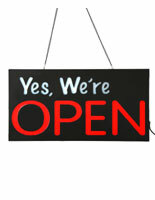 Some proclaim one status, while others can be changed between the two as needed. 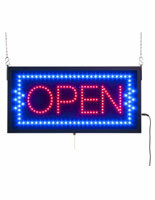 Additional information such as "7 days," "24-hours" help customers understand whether a store is ready for business or not. 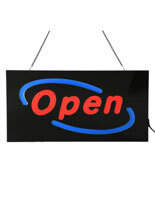 Highly noticeable hanging window boards can make the difference between a customer passing by and a sale. 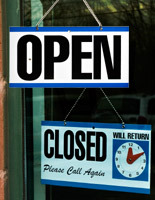 Business Hours messages let customers see when services will be available. 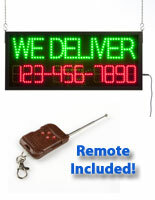 A hanging board with specific hours will allows potential patrons to know when to return, and can be a key factor in ensuring that patrons don't feel their time was wasted. 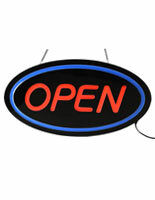 Restaurants and Food Service establishments frequently use service or product advertisements to inform customers about new or specialized items. 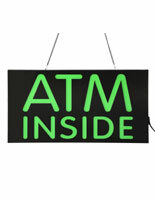 "Coffee," "Frozen Yogurt," "Delivery" and "Drive-Thru" signs let customers know without having to ask that certain products are available inside, or attracts people who are looking for that specific service or item. 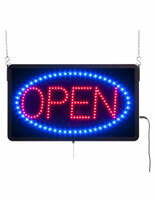 Specialized stores frequently rely on open closed signage with specialized messaging to attract customers. 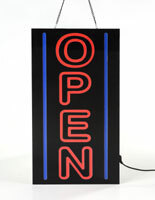 Spas, Nail Salons and Tattoo parlors all offer personal services that are very different, and clear signage with specific messages ensure that potential patrons know what they're walking into. 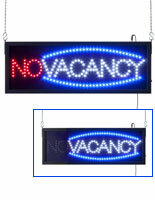 Other industries such as nightclubs, hotels and even general stores can all take advantage of boards that range from the industry-specific (such as "Vacancy" and "No Vacancy") to the more general ("Welcome" and Lottery") to messages that help differentiate one establishment from another ("Beer" or "Liquor" or "Free Wi-Fi"). 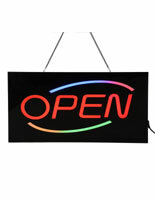 Durable plastic casings, brilliant and energy-efficient LED lights, and a variety of styles and colors make it easy for restaurants, retail establishments, professional and commercial organizations alike to find signage that informs and attracts customers. 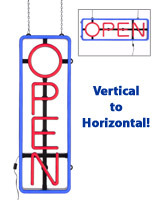 From simple write-on boards for business hours to multi-function animated LED "No Vacancy" signs and other industry-specific messaging, high visibility signage that lets customers know what a place is, what it does, and when it does it is key in building, and keeping, clientele.